On a windy day "Happy Jack" will be a whole circus out on the clothes-line post. If he can be painted in bright colors so much the better, otherwise he can be decorated with colored pencils. 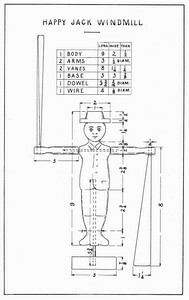 The body is drawn on a board, 9" × 2" × 1/2", by measuring all the figures from the hat down, and at these points drawing lines square across the board; also, draw a center-line from head to heel. The toes and hat rim split easily, so be careful of these parts. If no scroll-saw is at hand, saw every 3/8" with the back-saw straight across from the edge of the board to the outline of the body; then pare these little pieces away with a knife or chisel. The curves at the neck are best made with a No. 6 bit before sawing. The curves may be finished with half-round file or sandpaper. Take great care in boring the hole up the legs and across the shoulders; if a hole is started crooked, glue in a dowel of the same wood, let it dry, and then try again. Use a straight-edge as a guide. A No. 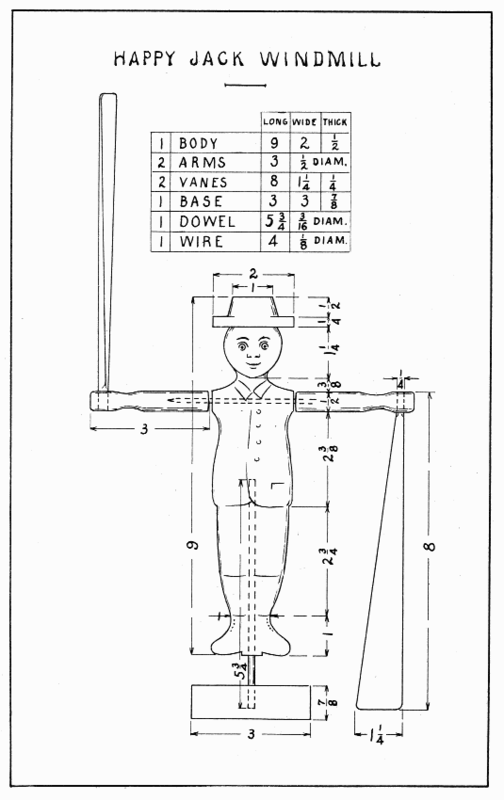 3 bit is used thru the shoulders, and a No. 4 bit up the legs. To make the arms, use a 1/2" hard wood dowel 6" long. Bore 1/4" holes for the vanes 1/2" each side the center of the dowel and file the wrists, before sawing it in two. Round the ends some with sandpaper. Flatten the 4" wire which goes thru the shoulders enough to keep it from turning in the arms. Drill holes in the arms to hold the wire firmly. Plane the vanes thin at the broad end. When gluing and nailing the vanes in the arms, remember that one lies flat and the other nearly edgewise; also remember to make them balance. Bore a 3/16" hole in the center of the base and glue the dowel into it. Before trying to fasten "Happy Jack" to a post, drill holes in the base for nails or screws.